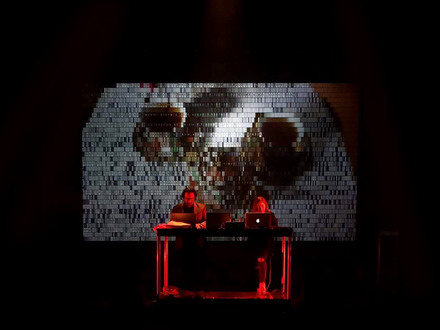 The artists have taken their live coding online in improvised live streaming sets, while on stage they brought their collaboration “Generative Cinemato-Graphic” to MUTEK MX, performing among art installations in the expanse of former steel factory La Fabrica. CNDSD & Iván Abreu have carved an avant-garde audiovisual niche into the brief recent history of live coding, using programming languages to make style-spanning ambient techno and IDM and in real time and in constant dialogue with evocative visuals. Malitzin Cortés began using code to create generative visuals while she was studying architecture at Mexico City's UNAM and ENSAP-La Villette Paris. Her curiosity led her to courses in open source audio synthesis software SuperCollider—soon she was creating her own digital instruments and sounds while incorporating live coding into the mix. Now she teaches and gives talks on live coding, generative architecture and audiovisual narratives. Her current multimedia practice spans disciplines and technologies: live coding, algorithmic music, expanded cinema, installation, 3D animation, generative art, sound design, experimental music and sound art. As CNDSD, she creates granular ambient environments of hypnotic noise and drone, breakcore and choral melody. Interdisciplinary artist Iván Abreu expands the poetic and political possibilities of visual art with scientific and technological processes. Among his sound sculptures and audio installations, he's created turntable-inspired sound pieces and large-scale installations such as Alarm, which arranged sheet metal alongside a roadway to sequence the sound of air as heard from a moving car. His work is included in public and private collections and he currently holds a grant from the National System of Art Creators of FONCA. At MUTEK, CNDSD and Iván Abreu explore the poetic possibilities of live code writing for audiovisual improvisation, layering cinematic visuals with geometric patterns as their algorithmic musical structures rhythmically unfold. Appears as part of Keychange :: Amplify. Presented as part of the Diversities project, with the support of the Agencia Mexicana de Cooperación Internacional para el Desarrollo, the Secretaria de Relaciones Exteriores, the Consulado General de México en Montréal and the Quebec government.